Welcome to Pine Tree Cottage! This lovely home overlooks Chimney Garden, which is a focal point in the community. 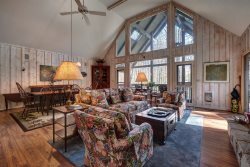 Cozy up to the fireplace in living room or enjoy a brisk evening next to a second fireplace on the screened porch. There is an open kitchen with separate dining room and a gas grill on patio. Master bedroom on main level and 2 guest suites upstairs. Come and enjoy cool morning walks in this gated private community. No smoking permitted in home; two week minimum stay required. Special Features: Fireplaces in living room and porch; master on main; private gated community.